KT was looking through her clothes trying to decide which outfit she wanted to wear when she went out later that evening. I was doing my very best to ignore her as I concentrated on my Very Important Work (Which may have involved flinging a bird or two at some smirking pigs.) I glanced up to find her standing right in front of me with a thoughtful expression and holding a short black skirt. My daughter asked me if I remembered the conversation we had earlier that day. With a few prompts I vaguely recalled KT telling me that it drove her nuts to be out and about without her phone and other small personal items. Her brilliant idea was to make some pockets in all of her skirts and dresses. Now, I’ve been a mom long enough to know exactly what was coming. I wasn’t a bit surprised when my eldest daughter gave me her sweetest smile and asked me if I could create some pockets for her skirt. After I grudgingly (Hello? I was in the middle of some Very Important Work toppling various structures down.) agreed to make them for her. Then she informed me that her friends would be picking her up in just under an hour. An hour really isn’t very long when you have to clean an inch of dust off of your sewing machine, hunt down your seam ripper and remember exactly what how to form a hidden pocket. I have no idea why her black skirt looks purple. As I scurried to form some sort of a pattern and chop up an old t-shirt to use as the pocket, KT was putting together a back-up outfit, “just in case” I didn’t finish in time. (Apparently, my child only has a limited amount of faith in my abilities.) Knowing that she really wanted to wear the skirt I was working on, I did my best to have it completed for her. Satisfied with my rushed work, I was finally able to tell KT her newly-improved skirt was ready for her. I wasn’t surprised to find that my handiwork was perfect. Well…except for the minor detail of not being able to actually put her hand in the pocket. Armed with my trusty seam ripper, I quickly fixed the problem with at least a minute to spare. With a grin and a quick twirl of her sassy skirt, my daughter yelled her thanks, blew me a kiss and ran off to enjoy an evening with her friends. I merely sighed and patted my sewing machine. Pleased with a job well done, I smiled and settled back down to my Very Important Work…. 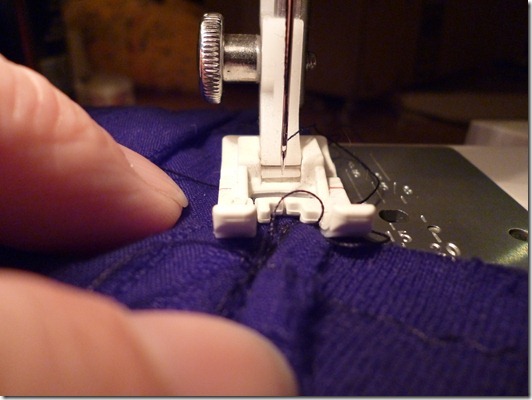 This entry was posted in Family, It's all about me!, KT, Sewing. Bookmark the permalink.